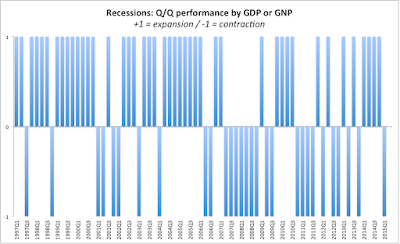 Having looked at sectoral growth contributions for 1Q 2015 and trends in annual (y/y) growth rates in GDP and GNP, let's take a look at quarterly (q/q) growth rates. GDP at constant prices was up 1.365% q/q in 1Q 2015, which is up on 1.235% growth recorded in 4Q 2014 and on 1.206% growth in 1Q 2014. 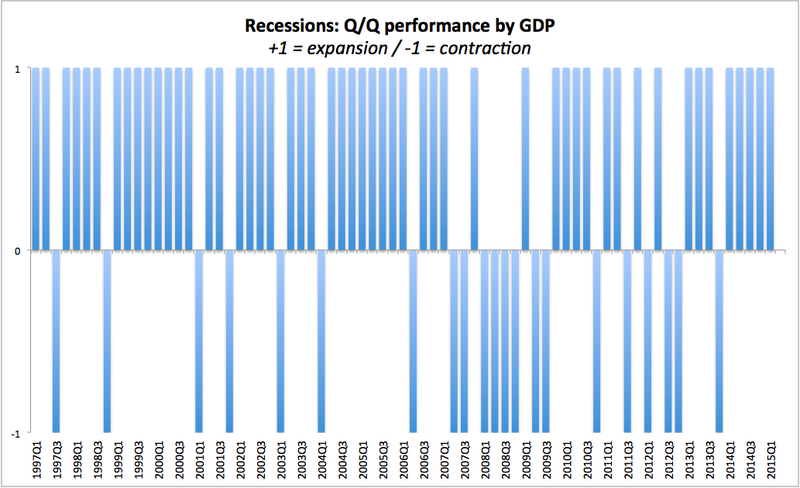 So we have acceleration in quarterly growth in GDP. 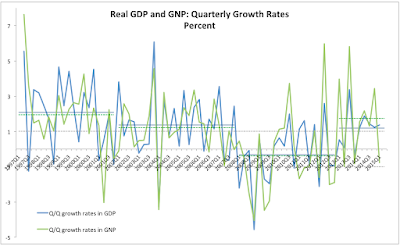 We now have five consecutive quarters of positive GDP growth with rates of growth all statistically above zero. Good news. GNP, however, posted a decline in q/q growth of -0.762% in 1Q 2015, which contrasts with 3.43% growth q/q in 4Q 2014 and with 1.554% growth q/q in 1Q 2014. This is the first negative growth quarter for GNP after four consecutive quarters of expansion. 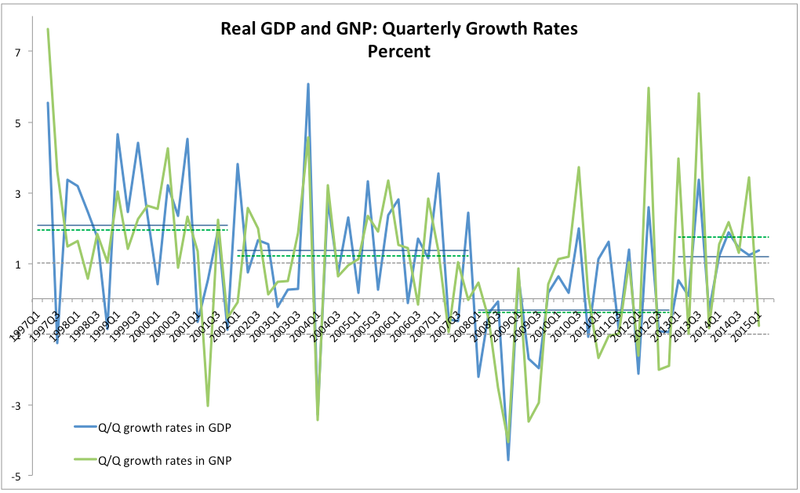 Chart above also shows how dramatically higher volatility in GNP growth figures has been in recent years. Over the entire history of the current series (from 1Q 1997), quarterly GDP growth volatility (measured by standard deviation) stood at 2.0076. This fell to 1.42225 over the period from 1Q 2011. So volatility in GDP growth declined over the recent period compered to historical. The opposite happened with GNP, which had historical volatility of 2.24441 and volatility since 1Q 2011 of 2.6658. So volatility increased for GNP. 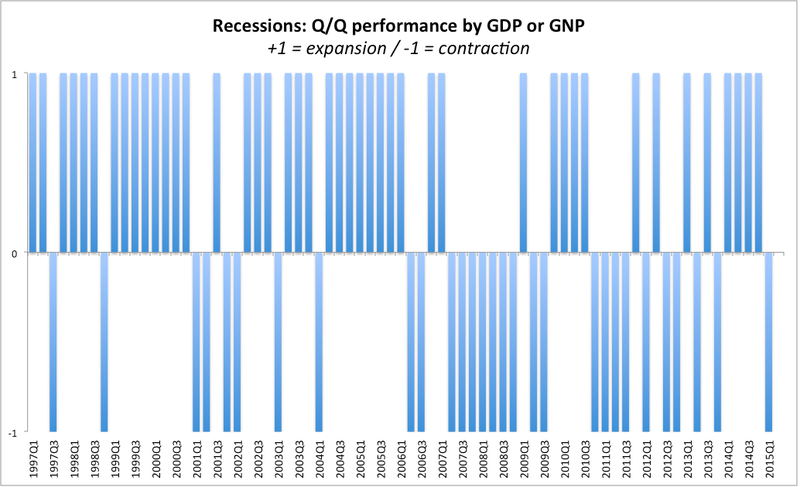 The two charts above reinforce the argument that we do indeed have a pretty robust recovery, with 4-5 out of the last 5 quarters on solid expansion trend based on both GDP and GNP, five on basis of GDP alone. So on the net, the results on a quarterly basis are weaker than on the annual basis, with GNP posting an outright contraction. One consolation is that GNP decline of 0.762% q/q in 1Q 2015 is much shallower than Q4 and Q2 2013, as well as all other cases of declines from Q3 2008 on. However, negative growth in GNP is worth looking closer at, which I shall do in subsequent posts, so stay tuned.